-indicates a greater understanding of world temperature trends can be read here. Strong Upper Air temperature jump is not only associated to Montreal but is a world wide phenomenon, having very deep consequences, namely less convection causing La-Nina conditions for Equatorial Pacific, warmer drier temperate weather with less precipitation in the Arctic as well as everywhere else. The opposite Upper Air cooling is good for convection. Montreal Upper Air temperature tendencies is remarkably similar to many other locations on Earth. This net increase in Upper Air temperature is part of a bigger change wave stemming from the state of heat of planet Earth’s entire atmosphere. Each location may vary , dryer warmer Upper air makes winters cooler and summers much hotter, such as found in Russia great heat wave of 2010, which again Is part of the same overall phenomenon, if conditions are right (topography and warmer seas), a warmer atmosphere sheds more water, like it was in Pakistan. The precursor of La-Nina is in the air itself, warmest Upper Air in January Global history was its beginning. ROAM is an empirical formula based on the sun disk vertical diameter being directly proportional to the density of the troposphere. It considers a standard temperature of 263 K for summer atmosphere above Montreal . It is still very pressure dependent, just as density is directly proportional to pressure. This is the latest version of EROAM which will be likely improved to a full differentiated non empirical formula. Maximum recorded vertical sun disk diameter from 1 to 11 degrees, summer of 2010 in Montreal crushed all previous years,. Refraction method of measuring temperature is quite sensitive to important Upper Air changes, 2010 renowned to be warmest ever. Is reflected well by the number of all time highest expansion hits. Higher pressure, should lower the number of hits, but remarkably Montreal Pressure Averages vary by less than 0.4%. Maniwaki is largely surrounded by forest, unlike Urban Montreal, which does have a whole lot of trees. Yet the Upper Air signatures are almost identical as when measured from its center by the optical way. DWT is Density Weighted Temperature for the entire troposphere. By transposition I suggest that Montreal’s great Upper Air summer warming was part of a larger worldwide trend, mainly caused by El-Nino heat transfer, which collapsed by the weight of cloud seeds spread throughout the world cooling the planet in tandem with winter natural tendency to cause greater Easterly winds by temp and pressure differences with the North Pole. The lingering Upper Air heat accelerated the arrival of La-Nina because it is essentially anti-convective in nature, this basically stops the Ocean to Atmosphere heat transfer from occurring strongly. Rapid transition from El-Nino to La-Nina was perfectly timed to cause greater warming for the entire year. A rapid Collapse of El-Nino At about end of December 2009 led the way for a rapid formation of La-Nina in time for summer, which was devoid of clouds in many locations, in particular SE USA coast and Moscow, Western Russia. Causing an historical never seen before long lasting heat wave. Arctic Ocean ice melt was trending very fast until the Russian heat wave started, the two are related, a circumpolar ring of highs caused a very unusual Low pressure system to remain steady at about the North Pole from August to September. This Low saved the Arctic Ocean Ice from being flushed out to the North Atlantic and reduced a greater melt by more prominent clouds deflecting sunlight to space. Montreal summer was largely much dryer than summer of 2009. In conjunction with La-Nina. As expected, but Montreal was not the only place with less clouds, to the detriment of more pleasant weather especially in Western Russia. The rain and greater moisture as seen in Pakistan along with great number of tropical storms was mainly an North of the equator Atlantic phenomena, quite warmest in its history. Atlantic driven storms should continue giving greater moisture for the longer foreseeable future. The Arctic strangely kept being influenced by Low pressure systems since the summer. This gave great weather anomalies much caused by lesser ice allowing foraging Southern Low pressure systems to be maintained longer in place at greater latitudes, this gave the regular colder air channels longer time to exist causing deeper incursions towards the South, namely at this time Western North America and Western Europe ( I am not very familiar with Northern Russia but I am sure they are experiencing great heat and cold incursion temperature anomalies). This is the only phenomena not too easily understood, La-Nina should trigger a great loss of clouds over the Arctic, this was the case until the Russian heat wave. Then clouds dominated more than expected, in effect slowing down sea ice formation now like during beginning winter of 2009-10. It is this mystery which takes most of my attention. Best uneducated guess makes me believe that El-Nino is encroaching earlier than expected, by Arctic system still influenced heavily by Low pressure systems inadvertently jump starting El-Nino by the lowering of North to Equator temperature differences. These temperature differences are marked by the presence of violent Arctic blizzards, a regional weather war, between cold and warm air. Refraction temperature observation method merely duplicates long known temperature measurements, except they cover a wider area, and are more sensitive to abrupt changes, in essence the nature of the air itself can be seen by observing the sun as a fixed sphere while the earth turns, but the jump in sun disk sizes in Montreal summer 2010 was simply overwhelming and may indicate we have reached a new plateau in on our way to a much warmer planet. 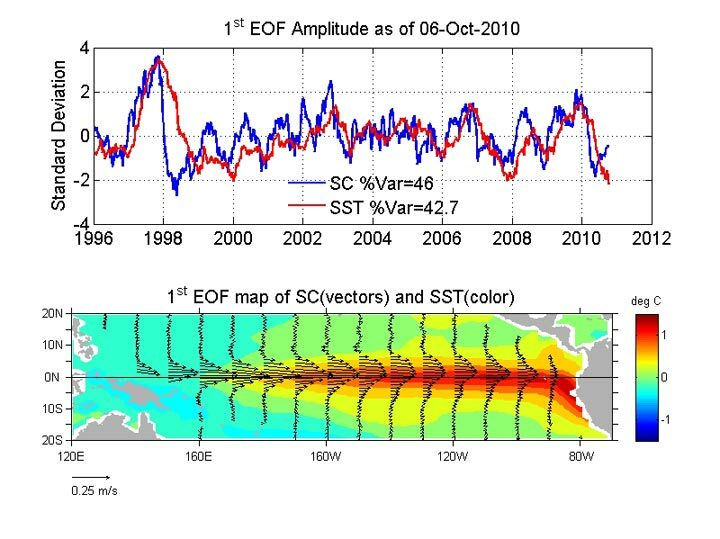 ~ Standard Oscillations give different results when vast sea and land surface properties change.. Weather oscillations such as the Arctic Oscillation give a consistent flow of air over vast areas. If vast surfaces are different, weather patterns and temperatures are affected likewise. Not necessarily giving the same expected scenarios. In the english language world wide internet, there is no better place to study live meteorology and climate than at Weather Underground. When Doctor Masters writes a forecast, its news onto itself. I agree with most of what he has written about 2011. I can only add a few crumbs of extra information to complement. There was a time not long ago, when distinct climatic zones of planet Earth were segmented, almost as if each region had its own weather system. The correct way to forecast, the ultra modern way, is to look at the entire planet as a whole. Such as Dr Masters does. I am beginning to grasp ENSO's biggest mystery, the December collapse or cycle switch conundrum. More often than not, ENSO switches modes shortly after December, either El-Nino turns towards La-Nina, and or El-Nino cools to La-Nina. This is largely due the advent of winter in the Northern Hemisphere. The Southern Hemisphere is hugely buffered by much more ocean surface. Ocean temperatures vary a whole lot less than the atmosphere. However the Northern Hemisphere has often brutal changes, from very hot surface temperatures to very cold over a much larger landscape in less than a year. This is the engine of change causing climate shifts for the entire planet. In December, the Arctic sea surface has more star light than cloud to surface IR reflections, this means that radiation is escaping to space more while stars twinkle longer. This triggers huge surface inversions, exacerbated by lingering residual heat from summer in the Upper atmosphere. These Inversions are opposite to convections, the air dries, in turn causing ice crystal showers, ridding the air of moisture causing it to be even colder. From this point, entire continents go into deep freezing, in turn spilling cold weather all the way to Florida and sub equatorial seas. The lower sun also decreases the temperature of the Upper Air. This insures more convection over the Pacific equator, if the Upper Air warms, there is a decrease in convection, breaking winters punch. Picture late 2010, a very warm year, soon to be announced the warmest or very nearly so. I will show on my next piece, Upper air explosion of heat, still lasting late in the year. This warm air is no good for convection, hence Earth experiences a moderate La-Nina, due to warmer Upper air reducing convection. But after December this changes. As cold air from Arctic long night clashes with the heat of 2010, convection has a better chance of flourishing. When the Upper atmosphere cools more than the sea surface, La-Nina fades. 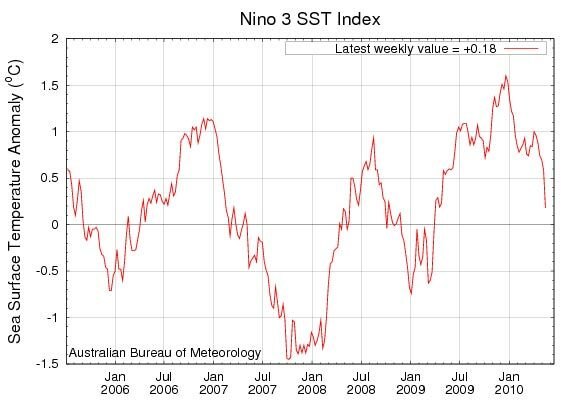 A very strong E-Nino like 1997-98 injected more ocean heat in the atmosphere therefore impeding the effects of December's switchover causing La-Nina to linger, in this case, for years. 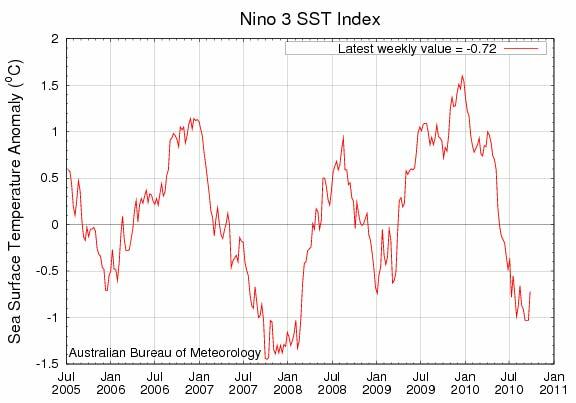 2009-2010 El-Nino was not as strong, from its collapse (which occurred during the warmest Upper Air in January history) a moderate La-Nina followed with lingering anti-convective upper atmosphere heat which in turn faces the onslaught of Northern Hemisphere winter. The warmer sea in 1997-98 is key, it meant a greater heat transfer from the sea, effectively cooling it. This is quite not the case in 10-11, the atmosphere itself is warmer despite a weaker El-Nino, the Pacific Ocean didn't transfer as much heat as during 97-98, therefore the ocean of 2010-2011 will be warmer. El-Nino also collapses often after December, by the same event, winter, which should guarantee more convection, however there are other mechanisms, namely stronger Easterly winds, driven by the steep dT temperature difference between the Arctic and equator which always favor La-Nina to form. Finally cloud seeds rise less with a cooler Pacific, the end of El-Nino is a phenomenon of too much clouds giving less evaporation. The usual winter extra upper air convection (because its colder) is marred by warmer continents to the North as a result of El-Nino, a warmer Upper air again favors the formation of La-Nina. Giant El-Ninos similar to 1997-98 are always possible, its a question of key synergistic events occurring at the right moments . A strong La-Nina seems to eventually trigger a warm El-Nino, the lack of ENSO pendulum swinging causes neutral conditions that again happen when key events happen just at the right moment. The main difference between 97-98 and 10-11 is the heat injected from ocean vs NH winter convection scenarios. Too much heat injected to the atmosphere slows convection further, ascension of cloud seeds falter (99-2002). Less ocean heat injected (2010) favors more convection (as written below) propelling a greater chance to see the return of El-Nino come December 2011. 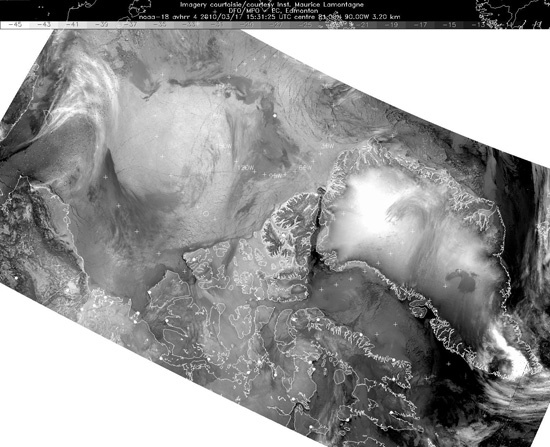 Seeing sea ice with Cyclone at the Pole??? 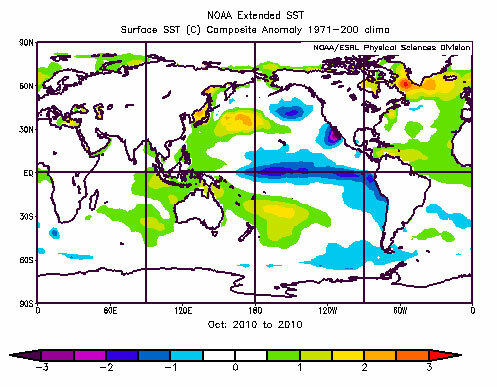 Last October 2010 well warmer than 2007 and 1998 for the Northern Hemisphere. Bo doubt this heat causes world wide differences in local climates. Increased Arctic temperatures should give access to more cyclones from the South, not crushed by the usual very cold High pressure Anticyclones usually reigning there. So it is certain that 2010 heat will make its own signature weather world wide, and give a rough time to La-Nina to form strongly. But there are other factors, more exotic, from what I read it is dryer near the Galapagos, question arises as to ponder on the recent East Pacific Upwelling sea water. Can it be less rich in soon to be evaporated cloud particulates? Keep in mind this is middle of summer, when La-Nina should usually fade or be weakened. All pictures courtesy NOAA. La-Nina appears to peak or is greatly slowed by very warm conditions world wide. 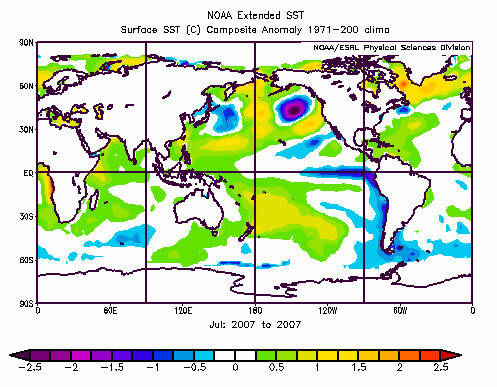 But the cold sst spots are similar with July 07. Confidence in this comparison is relative to the season, but it seems reasonably similar. Does seem to indicate not much change as La-Nina has stalled more or less now. But Dec 2007 had a major cooling before La-Nina vanished, caused "big blue" Arctic skies until april 2008l. December 2007 as March 2011, if so, would be quite a cold March. But the March of 2008 had a rapidly fading La-Nina. It was the onset of Spring, which usually changes El-Ninos or La-Ninas like wise. Spring of 2011 should coincide to a fading La-Nina peaking in November-December 2010 . Climate mechanics are so that La-Nina and El-Nino usually peaks in December, but in late 2010 Arctic sea level pressures are low coupled with very warm surface temperatures due to greater cloud extent. This can put a severe dent in La-nina cooling trends. The next big unknown player is the Stratospheric Polar Vortex, which has just started spinning strong, this high altitude Cyclone will have hurricane strong winds, keeping cloud seeds in suspension until it collapses. If it collapses early La-Nina will demise quicker It is likely to collapse early during a La-Nina with fewer Ozone destroying chemicals. But if it lasts long La-Nina will have a cloud free very cold winter Arctic to drive Pacific equatorial easterly wings stronger. ~ La-Nina collapses from its own seeds. October 25, 2010 Arctic proof of a collapsing La-Nina. high Stratospheric cloud seeds, not numerous but significant, well above jet lane (11 Km), despite a moderate to strong La-Nina. During El-Ninos twililights are much redder. These black cloud streaks usually appear when Southern thunderstorm activities is intense. Above to the right of Griffith Island (middle left) a red COTRA, condensation trail, well below the black streaks likely being cloud seeds, black because they are devoid of moisture. Historically, El-Ninos collapse under the weight of cloud seeds propagated, numerous and extensive this causes a cooling during Northern Hemisphere winter. Come Spring La-Nina usually trends in, as it was, almost for a year. But La-Ninas of old should not be the same as today's high octane Global Warming atmosphere. I propose mechanics of La-Nina largely controlled by less cloud seeds, as it was in 2010 mainly in the the mid latitudes at times the Arctic as well. Due to a cooler equatorial Pacific. But also the Ocean brings up deep nutrients for sea life as well as new cloud seeds. Of which a less cloudy Pacific evaporates nevertheless water vapor to the stratosphere, A collapse of La-Nina is caused by the very cold sea water which creates it. New seeds, carried over worldwide, having a deeper impact especially over the Northern Hemisphere. eventually seed more clouds causing a polar cyclones to reign, slowing down Easterly winds (especially during summer) at the equator. Marking the beginning of a new El-Nino. What is fascinating is the apparent longevity in some past La-Ninas. Spanning years. Requiring deeper study. But for 2010-11, it seems obvious that there is simply too much heat in the world systems. The best comparison is 1997-1998 giving a deep La-Nina lasting 2 years or more. 97-98 and 2009-2010 warmth of the stratosphere is key, very important in causing the Polar Stratospheric Vortex, as it was in 1997, extremely strong deeply cold, just like 2009-2010, but if 2010-2011 has a deep vortex , come summer El-Nino should be triggered, if the stratosphere doesn't cool and spin substantially La-Nina will fade gently. Either way 2011 will not be warmest in history. But 2012 will be, simply because 2011 will prepare 2012 for a warm 2011-2012 cloudy winter, depending on how cold the stratosphere is this spring, 2012 will shatter all 2010 records, or will just emulate 2010. 2011 will be a warmish year with no substantial signature event, except that La-Nina will not last long, La-Nina seems destined to fade, as it does so, right off phase from December, the warmth of 2010 will not be replaced by extreme cold weather but rather moderate winter, not so cloudy summer (neither too hot) , but a very warm fall leading the way for a 2009-2010 like winter for the Northern Hemisphere, I dont see any significant event except tor Hurricanes hitting North America again. Sea surface current almost always precedes sea surface temperature trends, so the blue trend is up while sea surface temperatures have more or less remained stalled. This is exactly the same signal I am getting with La-Nina dry air (ie Hurricanes struggling hitting land having dry air above), as opposed to Arctic clouds, in strong dominance since the great Russian heat wave (mixing up a simple La-Nina summer event). The stalling La-Nina marks perhaps an halt for greater dry air. But La-Nina is usually a spring phenomena, unless a very strong El-Nino hit the Pacific. 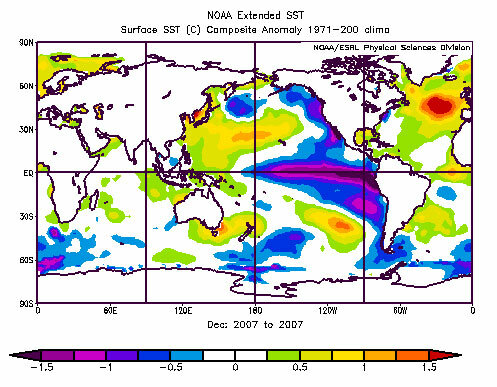 El-Nino is more or less a Christmas event, for now features of the two are intertwined. Given current signals it seems El-Nino will come back sooner rather than much later, as all ENSO models show a return to the neutral zone early next year. COLA CCSM3 is more like it, but it will be really amazing if so, in this case it would take a remarkably low pressure average for the Arctic Ocean, in effect again, like last summer, trying to jump start an El-Nino from a great distance. Nevertheless, trends are very important, a strong ENSO trend usually gives a great deal of clouds (El-Nino) or fewer clouds (La-Nina). Given an upward ENSO temperature trend during the spring, means a mild winter, but with greater winter spring clouds, which will spare the Arctic Ocean ice from the sun avoiding a Spring 2007 or 2010 repeat. Just where is the temperature trend heading? Its not freezing faster from a cold wave, it is warm up here in the Arctic, the sea surface is less saline, still about -11 C surface air marks the onset of the Ocean regaining some ice (very similar to 2007). 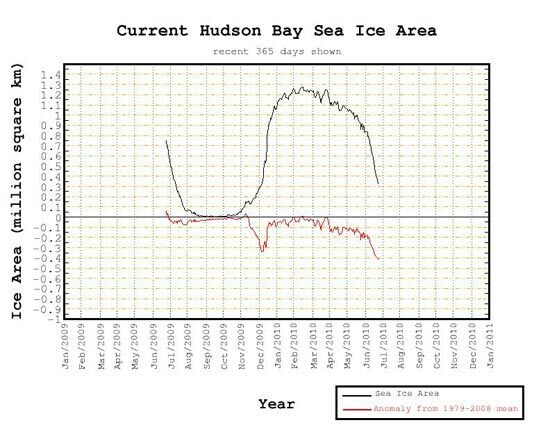 But some seas like Hudson , Baffin Bays have warmer water which will delay winter in many parts of North America. Not apparent, El-Nino appeared during a La-Nina, by a reversal of Hadley circulation, blunting the cooling cloud freeing La-Nina trend. El-Nino should normally appear during summer peaking in December, Winter will be warmer than I expected, in a few weeks I will project 2011. -Cloudless skies fueled the heat. Again the Arctic Northwest and Northeast passages are open. To add on to doctor Masters report , I must point out that Arctic whalers circa 1611 to 1930, never ever made it through the NW passage, despite being over Arctic waters virtually every year for 300 years. The Bowhead whale and this link species are also distinct from North Atlantic to North Pacific, meaning that they were limited also like the whalers chasing them by incredible ice barriers which no longer exist. The heat of 2010 was so strong it reversed the usual High pressure usually centered North of Alaska, the very reason for the Beaufort Arctic Ocean gyre was nullified by a near constant low pressure in its stead. 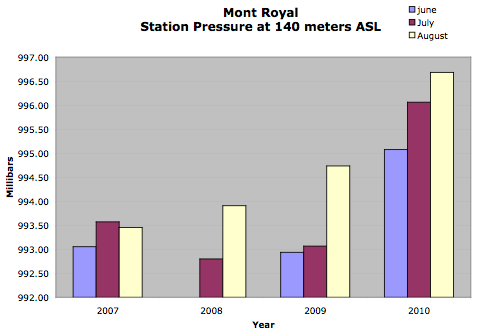 Even in 2007, equally a warm year, this High pressure stood out as the main reason causing Arctic Ocean all time melt. In principle, a natural High anticyclone exists at the Pole, just like the Earths magnetic poles, it is not situated at the North geographic Pole but North Of Alaska, making perfect sense, usually explained by Hadley cell circulation. However 2010 summer had the reverse Hadley cells at the Pole, or likely a split Ferrel like configuration. Leaving the Sub-Arctic immersed in clear air , causing record heat signatures throughout the Northern Hemisphere, characterized by near static high pressures baking places like Western Russia and the island nation of Japan. The clear air expected due to La-Nina manifested itself there. The outstanding feature of this is the seemingly puzzling flow of warmer air towards colder air Northwards in the Arctic, which is usually not the case, since colder Arctic air is denser, thus is naturally under higher pressure, but the heat generated by static sub-arctic highs maintained descending air, with higher pressure, reversing the usual scenario, causing heat to flow Northwards, naturally causing unstable convection (fueled by high latitude colder upper air) rising at the Pole causing clouds, forced clouds, not the typical Arctic seeded clouds from descending air. In short, quite a remarkable planetary wide role reversal. followed by La-Nina "big blue" during spring summer, is ideal for world wide heat events. Dr Bob Carver's analysis of the great Russian heat wave of 2010 is nothing but complete , in a standard Climate or Meteorological presentation way. Also unusual for most presenters to include Global Warning as a factor, most TV presenters are allergic to the term GW, having very little studied the subject or constrained by the great politically motivated propaganda illusion that its a flaw in the science which makes TV possible. However, Dr Carver is bang on, but there is more than explaining symptoms and some causes, , as opposed to my hypothetical way of explaining why there is a heat wave of such magnitude in the first place. All traditional explanations will eventually change, and include, the anvil seeding factor. 2010 is much to do with a Moderate El-Nino collapsing in spring time, literally leaving La-Nina clearing the way for no clouds in great segments of the world. Tropical Cumulonimbus anvils are less dominant over the Pacific's colder water, also this Pacific not evaporating cloud seeds vertically as much as during an El-Nino which causes more clouds world wide, from greater evaporation of water, optically this is seen as red horizons during twilights. colour map courtesy NOAA, Notice the Polar regions. One picture says it all, 2010 is warm because there is less La-Nina driven clouds. July 20 2010, no blackish high above Cirrus cloud seeds in sight, this Montreal observation is as important as any place, simply because air never stays at the same place, its in constant flux, the air over MOntreal is likely similar to many other places world wide, especially in the Upper atmosphere. 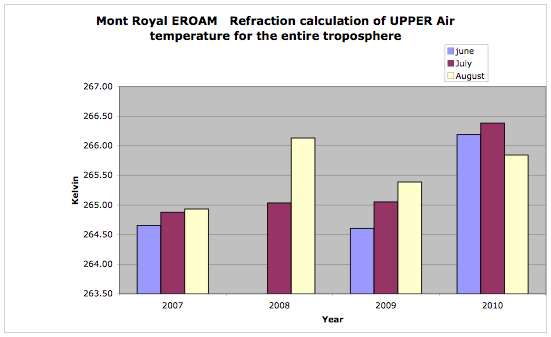 As projected here last year on EH2r news, a perfect world wide temperature projection comes from 2 theories. 1: Measuring temperature of the whole atmosphere, finding weaker optical refraction by observing expanded sun disks, no trivial matter since this method covers a great atmospheric expanse. 2: Lesser cloud seeding from the seas particularly the Pacific during current La-Nina. Great Asian Russian heat have disturbed planetary waves apparently forcing a near permanent low over the Arctic Ocean, as the last cool place in the Northern Hemisphere, is surrounded by very warm weather. I see this phenomenon as a natural effect from less cloudy land areas, causing prolonged slow moving anticyclones, fed by dryer hotter air, I have never seen these patterns before. This of course slowed down ice compressing over the Beaufort Gyre, having in effect caused a stall in what would have otherwise have been the greatest melting ever. The lack of persistent North Atlantic lows is another key feature making the UK unusually dry and warm. This is very interesting. If there is a persistent high over the North Atlantic, this would eventually accelerate the melt over the Atlantic side as opposed to the Pacific Arctic, making eventually the North Pole vulnerable to open water from 0 degrees meridian instead of 180. Given that ice will flow towards the Atlantic, a constant replenishment of ice gives the illusion of no melting, also making unlikely event that the Pole would be ice free. However, 2 months away from freezing onset, ice extent is already lower than many preceding years. But the Atlantic side melt is to watch closely. Not to say that gyrations towards a stronger La-Nina, ie even lesser cloud seeds, would make conditions better for a high anticyclone over the Beaufort Gyre area, but It is again certain that the Northwest and Northeast passages will be ice free. I have changed lenses and telescope methods in order to confirm unprecedented Montreal sun disk expansions. It seems so, the telescope gets a rough ride as it needs to be mounted dismounted every day on its way to the Mount Royal, as opposed to a fixed location in the Arctic. 2010 expansions have reached the 50% mark , meaning that 100 sun disk elevations, from -0.3 degrees all the way to 10.8, 10.9 and 11 degrees 2010 average sun disks are more expanded than all previous years (going back to 2003). Sunset clouds are extremely rare compared to last year, number of observations have exceeded 300. 50% is a calamity of sorts, also confirming 2010 as really really hot year. NOAA, dr Masters all agree, its hot world wide. For Dr Masters..... I wonder if Saharan sand dust uplifts would luckily abate the hurricane season ? Sea ice latest trends may seem to indicate a slow down in its melt, so did Hudson Bay ice, just before record vanishing act done a month ago. Extent is so tricky to analyze. But Low pressures North of Alaska may have been a response to ENSO glitch in La-Nina trending which will not last, as La-Nina is officially present. Planetary waves formations undulations are really like musical strings, set the right tension they vibrate at a different sound. now we have world wide heat, unusual weather tuning, it seems Asia is playing a role in affecting Beaufort sea waves, but as soon as a High pressure resumes over there, the ice curtain will shrink as fast as Hudson Bay. According to weather underground many all time high temperature records were recently broken...There is no doubt that these heat records come from a twosome: El-Nino as Dr Masters have written, but also from clearer drier skies which come when La-Nina is about to hit or when El-Nino collapses rapidly, with less cloud seeds injected from the equatorial Pacific, there is less clouds world wide. which adds to the over all Arctic sea ice melt incredibly to an all time record. The extent anomaly for Arctic sea ice is equal to the anomaly of 2008 at its summer end. 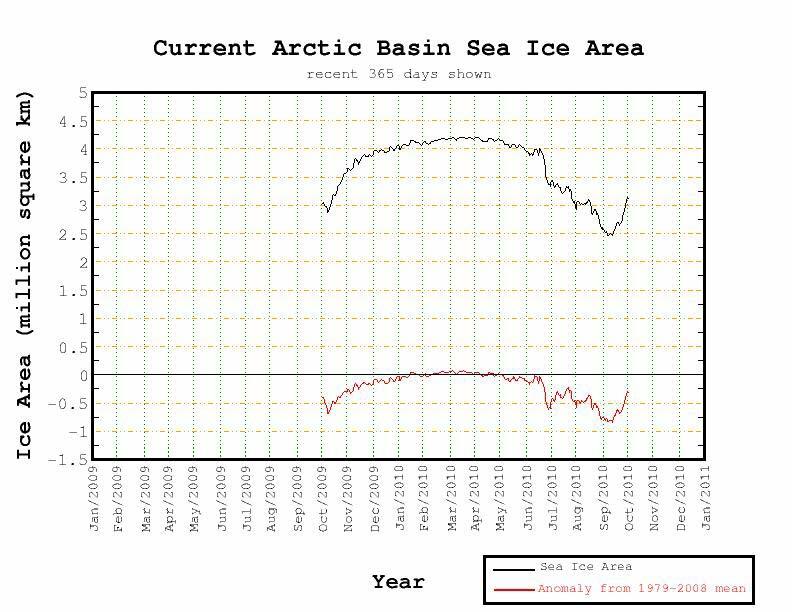 Which is 2 months ahead of time in 2010, making 2010 the coming all time most melted Arctic Ocean ice ever. Hudson Bay had a very warm winter, it took a while, but the thinner ice from winter past didn't resist the spring heat as much as previous years. Dr Masters encapsulates very well world wide heat supreme for 3 months running, assuring 2010 being warmest ever year a bit closer now, as expected. Montreal sun disk per level expansions are through the roof , 37% strong compared to 8 previous seasons, this is more than 20% next to its nearest rival, 2006. From 2009 (left) to 2010. A 1% jump in size of the sun disk is an incredible leap (2nd bottom number from left). temperature difference of the troposphere is estimated to be about 6 degrees Kelvin. These temperature jumps are not uncommon, but consistent expanded sun disk diameters running 3 observations days in a row, at all elevations, despite colder air surface temperatures, is very rare in temperate climatic zone, after 8 observation seasons, never noticed before. Sun disk expansions are related to density layers. 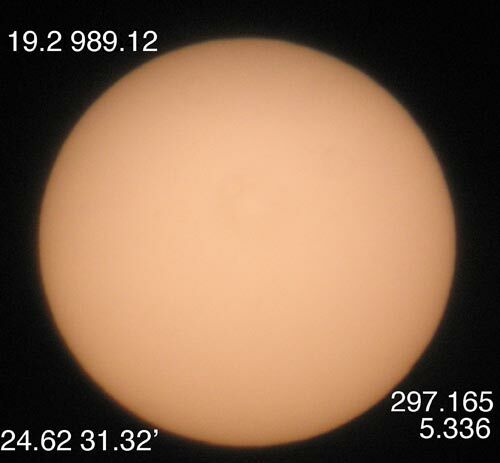 More numerous and dense; the sun shrinks, more warmer and less numerous; the sun is observed as expanding vertically. 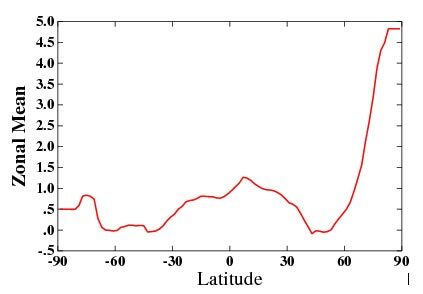 Since there is no known true expansion of the sun in space, the atmosphere is responsible for this variation, pressure has an effect on this, but it is largely directly linked in reducing vertically the sun disk size, in this case the pressure is greater for the most expanded sun disk seen in 2010. This means warmer more homogenous air looms above, a sure sign of a warmer drier summer. Montreal data was never this strange in the past. ~ What does it mean? La-Nina is all but a sure thing, with it comes bluer skies, as with Anvil seeding theory, the larger part of Equatorial Oceans are cooler, except from the much smaller but extremely warm Atlantic, less clouds will be spawned from fewer cloud seeds. Unlike 2007, much cooling occurred a few months later. This ensured a warm spring, coupled with clearer subsequent cloud free skies, pretty much everywhere in the world, but most acutely for the Arctic, which will now melt even faster. ENSO seems to be more in sync with what it always usually was, El-Nino is a product of summer, lagged well until Christmas, when it starts to collapse, lead by a cloud free Arctic which usually starts in Early November. Then come early Spring, La-Nina, child of winter, lagged and created by cold dense Polar air, starts once again, this is tempered by a less violent in temperature change but still prominent Antarctica winter summer, mostly winter, therefore less of an influence. Top all that by cloud seeds, and you have a better view of the world climate system. Europe should be wetter than North America which will be much drier and especially hot. The Arctic very blue will see an onslaught of melting exceeding 2007. The warmer Arctic has already changed weather patterns throughout North America. Violence of weather systems necessitate cold warmer contrasts, so most violent weather will be moisture driven. whenever there is some, especially from the Atlantic. obvious, but 2008 had the greatest big blue event in Arctic history over the last 25 years. I would expect a great rapid ice Arctic ice extent recovery, triggered by a great melt of surface salt free ice, but all and all less old multi year ice yet again and a few surprises, from the unfamiliarity of great melts . So the argument of global cooling since 1998 rests in the dust bin of tabloid fantasies. If 1998 El-Nino was warmer than 2010, since solar activity is lowest in many years, shall the contrarians see the Global Warming signal giving all time warming? One can only hope they reason beyond the strength of their ill conceived beliefs. Not extraordinary considering this was predicted last year, Anvil seeding theory rocks. Differential Refraction readings of sun disks are extremely expanded, 33% of all average sun disk measurements from -1 to 10 degrees elevation are all time highest vertically. A veritable crushing of all preceding years since such measurements were done (9 spring seasons since 2002). Sun disk measurement comparisons almost never fail, now the only thing stopping a very severe ice melt, are Arctic Ocean clouds, presently showing strong from myriads of new leads breaking open, this will not last, as temperatures get warmer, big blue will vanish ice further. ~ NSIDC forgets to mention: thin ice melts fast! Its been 9 C outside, and the divers saw the ice melt, literally fall apart from the mere touch, fragile, and full of biological activity. This shows, despite, what appears to be no melting on surface, a loss of balance, between the powerful heat in the Ocean and the colder atmosphere, a balance broken from the higher sun. Back in frequent fall times, I found that sea water freezes when air equals or is colder than 11 C, especially in no winds. The reverse may be so, by conduction air warms the ice, to the point where it sets the bottom from freezing to melting. Thus sea ice. Is an expression of cold air, when gone, so is the ice. A confusing contradiction! …How can the Arctic be warmer , yet more ice present? The answer: its thin ice…So thin, its melting away very fast. A fading El-Nino brought about less Arctic clouds in March, this created a brief fast cooling period, but its thin ice , thought I complemented NSIDC’s usually comprehensive news releases. If El-Nino persists this will affect my melting prediction. A big blue event in May-June-July over the Arctic Ocean would do great devastation to an already weakened ice state. Unlike the usual spring time, the Arctic ocean should be covered with clouds, Ice crystals, fog water sky streamers instantly reacting with the high sun. Now this may change, but the latest trend is blue, sunny blue. But a 12 degree high sun at the Pole, is just about good enough to cause photochemistry. However, at the extreme edge of Arctic ocean pack ice, its melting faster, a high pressure over Greenland streams out older ice through towards the North Atlantic. This anticyclone of course lets sunlight shine right in the middle of the warmest spot of the Arctic, where temperatures are easily +10 C above average, where it rains, yes rains, when temperatures should be 25 C.
The clouds as witnessed by many North Americans during the summer of 2009 were not only hanging out in the Arctic…. Surprisingly, Eyjafjallajokull effects are not all as expected. I have measured unprecedented sun disk expansions amongst clearly distinguishable shinny ice crystals, too warm for traditional ones, they fall with brilliant reflections. Sun disk expansions went against my original thinking, sun disks should have been more compressed, due to cooler air from reflecting sulfates. But they were opposite, extreme expansions at all levels, beating already expanded sun disk measurement field from especially this year. It seems the volcano ash as a warming effect or property, water vapour was not prominent 3.7 mm for the entire atmosphere. What is the scores of what is the scores? A look back to preceding years..
2005 20%; 2006 16%; 2007 12%; 2008 13%; 2009 22%. Score: Northern Hemisphere temperature anomaly of +0.64 C (7th warmest). Zonal Polar region 64N to 90 N , anomaly of +1.42 C (5th warmest). (9th warmest). Zonal Polar +1.42 C anomaly (5th warmest). Score: Warmest year in history for Northern Hemisphere at +0.81 C anomaly. Polar zonal of +2 C , 2nd warmest behind 2005. The difference between warmest NH anomaly and 9th warmest is 0.22 C, for Polar zonal its 0.72 C.
There is a lot of statistical work to do in order to refine projections. Astronomical shifts occur easier with objects directly South, further to the North, they are harder to perceive. 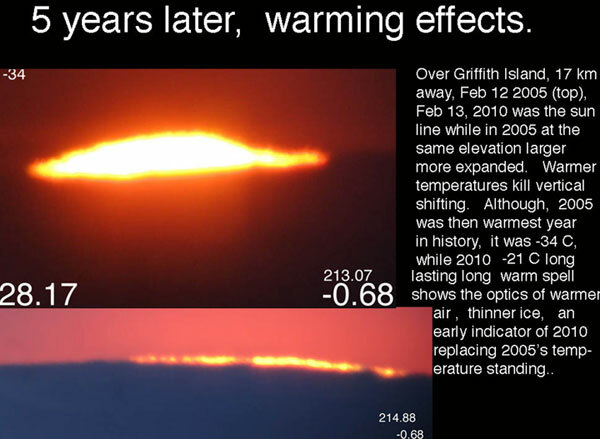 Yet March 29 2010 sunset indicates warming with every physical aspect of planet Earth. Astro shifts occur when significant temperature changes exist from atmosphere, to land and sea. The sunset here, clearly moved southwards and downwards. With March sun disk data almost completed, the evidence overwhelms. March 2010 has the most expanded sundisks ever by the widest margin, well over 2005 and 2007, a full 12% over what would normally considered as no warming. Full data at beginning of April. 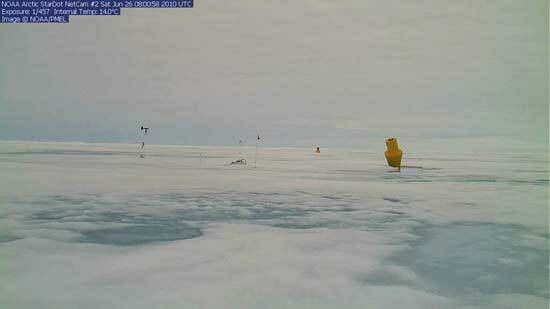 Today in Resolute Bay its -3 C when it should be -28 C, sometimes the temperature record is simply incredible. It confirms the forecast power with all these sun disk observations just done. Needless to project, 2010 is the warmest year in history, a made year, if it eventually doesn't, it will be very close to the warmest in history, but that is unlikely. The warming signal is simply too strong. especially consistent. 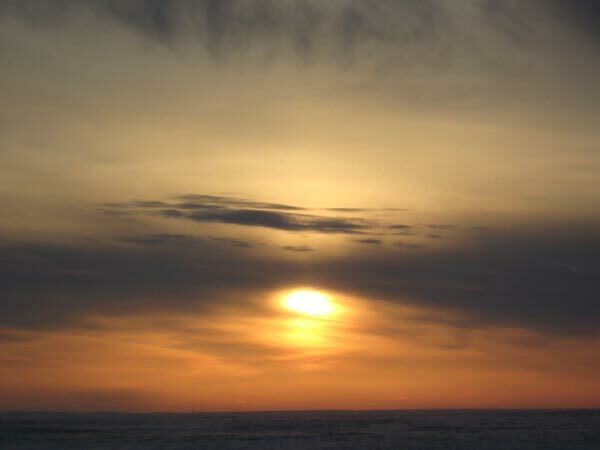 But now for the first time ever, I have to judge sunsets with greater difficulty in the West of NW passage, open water there distort, obscures and prolong sunsets in a totally different way. 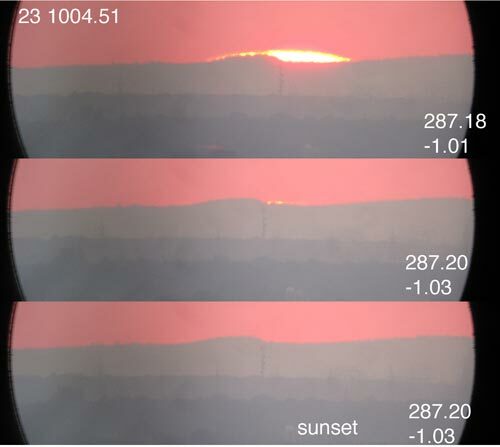 Typical of 2010, the rectangular sun is more scarce, the sun is much sunken even though the land horizon is lower than with the 2004 picture, the sun is a mere line, not not as risen as was in 2004 at the same elevation (top picture). But foremost there is heavily disturbed surface layer of red light, caused by water skies, inducing reflection of a refracted sunset some 50 miles away. 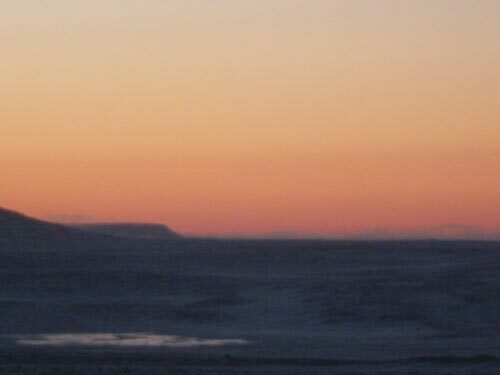 Red is mostly seen as it is scattered more in moist air, the ice horizon is low, yet the sunset is somewhat late, indicating a reflected sunset from where the open water gives moisture. To prove this, a sun disk left and right limb is projected upwards, showing a wider zone of brightness than sun disk diameter size. For the NW passage, this is entirely new. 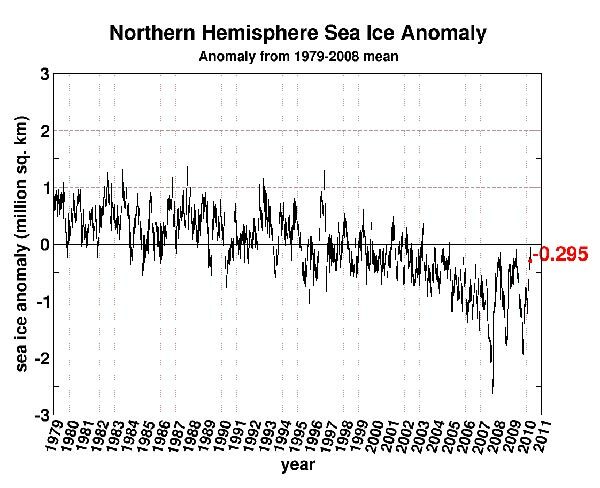 Another proof that there is a scarcity of thick colder multi-year ice, in its melting, new first year ice in its place breaks easier and foremost, makes the air above warmer. Winter as weak as it was throughout Canada will make a brief last visit. While the sun will melt a great deal of sea ice. Last years prediction has been flawless, ode to understanding how climate and weather works. All recent data points towards an incredible melt season. 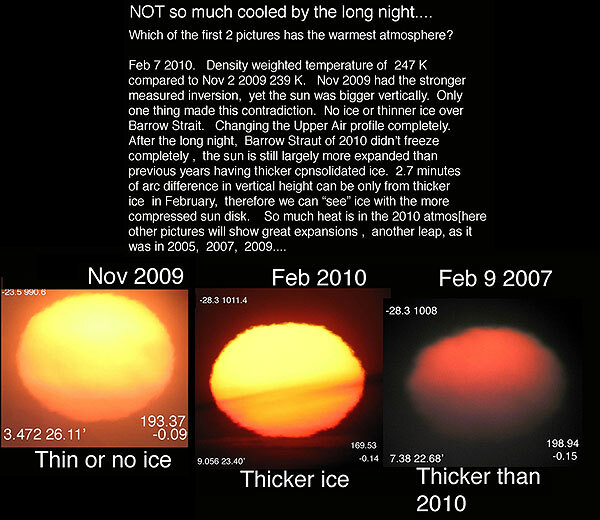 From "cold" 2002 and 2003 the sun was higher and was distorted by fascinating contortions. 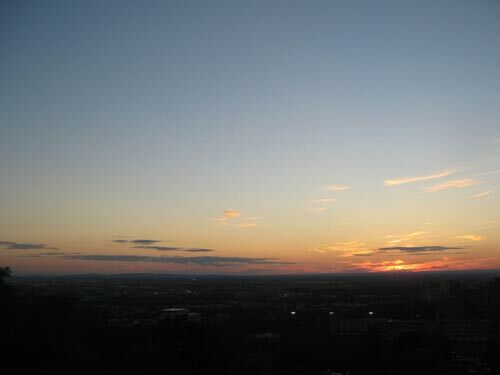 2010, same date, rounder sunset literally lowered in the sky by a great extent. BOM graph shows the stall is over 9 consecutive sunsets during a time when El-Nino cooling stalled was no contradiction. There is a lag between ENSO effects to the Arctic. Now we should expect a bit of a cloud break, then a March Big Blue, good for clear skies, and also for melting ice. Are the current equatorial easterly winds driven by Higher Polar surface Pressure? Remains to observe more, and find , truly discover, the ENSO driving wheel. Its so warm the sun disk appears to shrink! It seems opposite to what a warmer atmosphere sunset should be. But 2010 sunset disk didn't shrink near the horizon. 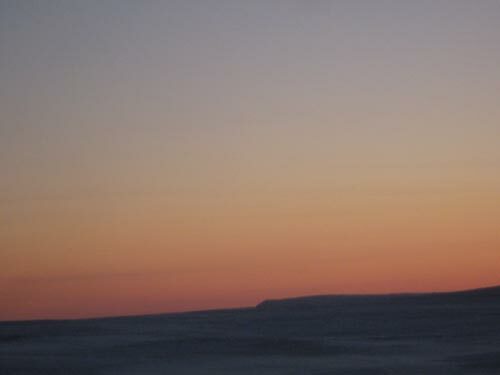 Usually sunsets rise in colder inversion rich weather, in this case it descended on March 6, sunken almost below the horizon on March 6 2010. The evidence is becoming visually overwhelming. I know that new thin ice immediately to the West of Resolute may be in part responsible with March 6 2010 being more than 10 degrees C warmer than same day in 2002. ~ Cloud free days reminder; is ENSO in the driver seat? Or its driven by other mega areas? influencing ENSO, in addition to its own internal mechanisms, influence the rest of the worlds weather. The last weeks or so were more or less blue, especially when blizzards don't come through. The pressure over the Arctic ocean has risen a bit, along hints of a starting big blue. I made many observations since last weeks blizzard end, with sunsets every clear sky night. 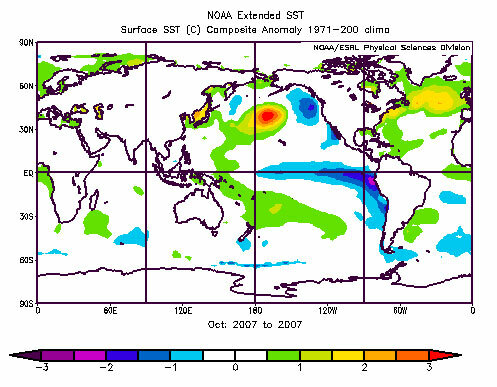 This coincided with a drop in temperature of El-Nino seas, but is it a coincidence? For explanation reasons, consider a simpler model Hadley single cell, where rising equatorial hot air reaches the Polar region directly, with colder polar air returning towards the equator on the surface of the earth, the returning colder air would give Easterlies. In principle, La Nina winds. Now decrease the Polar area pressure, Arctic clouds would naturally dominate, La-Nina winds weaken, giving better chances for El-Nino to form. The opposite, clear Polar high pressure air, increases the equatorial Easterlies, causing La-Nina. Thus the cold long night winter itself assures El-Nino in December more often than not, its very name, inspired by Christmas date, again no coincidence? Lets see, if the Polar regionshHigher pressures now, will change El-Nino cooling trend, now stalled a little, to morph into La-Nina. What's the score February 2010? 9 observation years makes anything above 11% a warm year. 2010 early vertical sun disk measurements exceed yearly average complete spring time measurements, indicating a fiercely warm year ahead. Since sun disks can only expand surely as the sun rises in the sky. Resolute Bay February 2010 has excessively warm average temperature for the surface and the entire atmosphere as well. Dr Masters recent articles explains recent Northeast US great snowfalls very well.... However, I predicted a wet warm winter..... At Mid latitudes, snow is separated by rain only by a few degrees, but there is not enough winter pushing itself to the Atlantic. Winter seems in retreat, or pummeled continuously by warm wet cyclones from the sea. The Arctic not providing strong lasting seasonally cold dry air . If winter was stronger, the air would be drier. since more often than not it comes from the Arctic for most of North America. Moisture is seen as clouds, El-Nino Anvil seeding maxima's are occurring now. Since November, they battered fortress winter with clouds weakening its base (ice) and strength (cold air), till this date. 3000 miles to the North from Virginia, its warm, how warm? All time highs for certain, +10 C above average very recently, on the ground and in the upper air In mostly clear high arctic air! Unbelievable. I study the weather patterns, they look familiar, there is a moderate High Pressure over the Arctic Ocean Gyre current, but Canadian temperatures surely are not normal. The only thing not looking right are multiple veins (leads) of the Arctic Ocean Ice sheet, showing chaos, the machinations of pure unconsolidated pack ice, in a mess from its former almost lead free self. The only source of heat to the -25 C Pole, atmospheric advection and the more open ocean covered by thinner ice. Contrast adjusted Infrared picture of the Arctic Ocean. Either the ice is seen badly broken by leads, or its covered by low warm clouds. 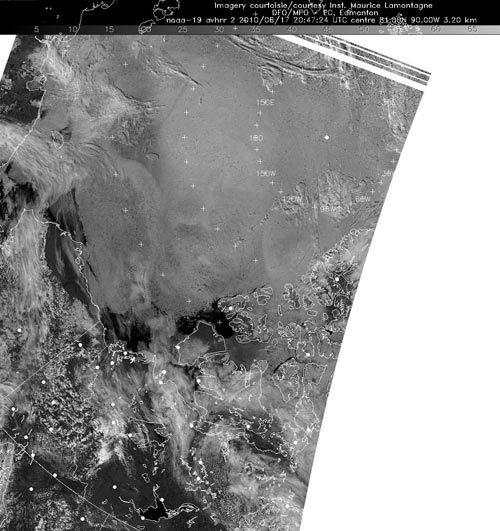 More NOAA images can be seen here. Further recent comparison by EH2r method prove that Arctic ice is no longer cooling off the air as much, as it use too, in a feedback loop of old, when ice thickened gradually over winter, making winter a cold monster with a thick white skin, especially over the ocean. Insulation of thicker ice, once greatly reduced, explains the impossible, warm air during starry nights following short low sun days. Having a sun so low in sky its heating over the surface trivial at best. Yet its warmer, much warmer. ~ Arctic temperatures on all possible measurable locations, exemplify the reality of climate science, to the great chagrin and ignorance of contrarians. ~ Reality is observed but nowhere near reported well. As Arctic observers at the forefront of Climate change can and only be wondering if some people are living simultaneously on the same planet, let alone the same country. Whether they simply can’t believe that one crucial well understood part of the world, observes exactly what models predict, further more, Arctic ice conditions have never been seen so bad. The ice computer models had it wrong indeed, its warming faster than expected, ice shows off the purest of facts, having world wide consequences. The basic concept of polar amplification is confirmed without noticeable deviation or potential error. Would a journalist please take note…. Integrated weather over many years made Arctic sea ice much thinner, proof, available for any to scrutinize, on many websites, does not make the news as much as the Nobel Laureates IPCC making a mistake. When summer of 2007 almost saw no ice at the Pole, it made some news, but this didn’t last. In fact summer ice maxima's have grown a little since 2007, all this is about to change. Scientific certitude is not a practice usually done without repeatable observations, the certitude is the warming, how it warms will vary as fast as the Earth spins. The casual observer will see one thing or another, the dedicated observer finds trends, not purely mathematical trends, but physical links from the trends often realized. Last years prediction holds well, El-Nino is fading fast: link in a similar way to 2007, the year when Arctic Ocean ice almost vanished at the Pole. Only La-Nina not returning in March will avoid the Earth from having only one Pole with ice. EL-NINOS are red, LA-NINAS are blue, even in the real world, this is true…..
~Aerosols colour the Arctic horizon differently during various ENSO phases. Following up on Anvil seeding theory, requires data, there must be solid repeatable evidence showing long distance impacts from an irregular aerosol source, more often than not triggered by warmer sea born particulates rising within evaporated water. The idea, total mass of injected particulates would be superior (El-Nino) or inferior (La-Nina) depending on the over all temperature of the Globe’s sea surface. When the sea gets into its warm phase, sky colours should be more red at twilight, since water vapour with aerosols are more scattered and penetrated by red, an already prevailing colour due to Rayleigh scattering. During cold phases, particulate free air predominate, leaving the horizon bluer, especially at dusk or dawn. During the last decade, no year came as blue as 2001, 2002 and 2008. 2001 preceded the most extensive La-Nina period in recent history. Spanning several years, it was the last extensive cold period, along with clear more blue winters. EH2r work started early November 2000. 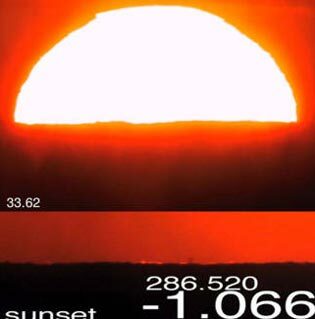 Unknown at that time, I was measuring the last great tardy sunset spans, the spring of 2001 had 7 sunsets below 91.7 degrees, while in 2009, 3. Again without realizing, blue skies dominated. The next time blue came back to mind was during spring 2008, right after the most powerful La-Nina in recent history, exceeding or equal in intensity with the period after 1998. 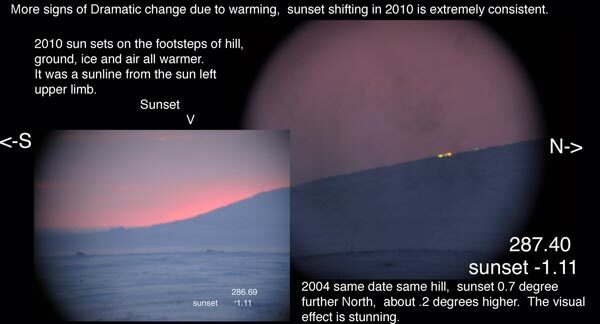 2008 was a little different, Arctic Ocean sea ice was thinned further, and I didn’t get many sunsets due to a near constant horizon cloud base, a water near permanent water sky perhaps, but many sun disk shots were very brilliant low on the horizon, proclaiming aerosol free air. 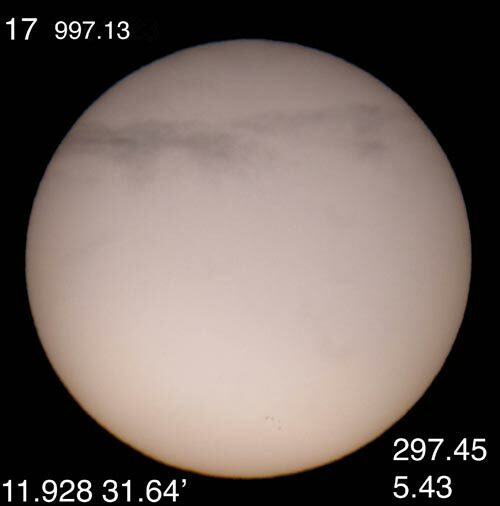 The following flash sequence gives a few examples very carefully selected because of digital camera distortions, the key area of study is the horizon, when more than 40 atmospheres show differing colours based on the smallest changes. Of late, predictions done in the spring of 2009 have come through, so far it is, was mostly, a wet warmer winter. Having foresight, is one thing, although weak it may be, since it doesn’t explain how. Understanding meteorology outside the computer model is another greater level of sight through reasoning, transcending the results of the models without massive calculations, eventually another idea will improve them, but a better model starts from the brain lost in deep thinking. Should great precipitation events happen randomly? Why don’t we have this type of weather during La-Nina periods? The link is not only found in El-Nino heat to atmosphere injections, but heat with moisture having seeds, spreading well upwards, scattered all over in the Globes lower stratosphere. In the Arctic long night, they land as ice crystals, dimming the stars a little more, of which alike whence they came, from High up, except they cause clouds similar to Cumulonimbus anvils, warming up the dark night, making it easier for Oceanic cyclones to break the grasp of winter where it is usually a fortress of cold air. Over the years, right under, the Arctic ocean ice thins, in tandem with an onslaught of clouds turning the occasional Cyclone visit into wave after wave frenzy of cyclonic warmer air penetrations. Winter fortress walls crumble from within, even during the lowest solar activity in a very long time. Meanwhile, meandering jet streams reflect these unsteady walls, causing cold where its usually warm and likewise opposite. The meaning of weather once known as chaos becomes more tamed by the smallest of particles. 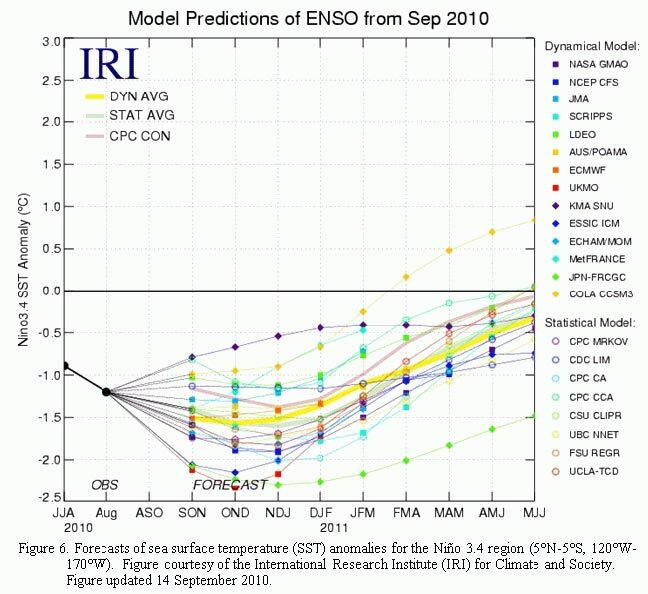 2009 quick review; refraction method bang on correct for the Arctic, however the rest of the Northern Hemisphere didn’t follow. Although it was 3rd warmest year in history Globally and the warmest year in history for the Southern Hemisphere. All time high temperatures throughout the Arctic springs the question: why was it so cold in Florida lately? Confusing it seems? And all time warmest winter is not always warmest everywhere, planetary waves mixes things up, sometimes they simply remain stable. Causing one region to heat up, while the other to freeze,. Meteorologists tend to define one cold happenstance with a cycle like the NAO, but even the most prominent meteorologists can’t explain why these oscillations happen, they just exist at one time or another. These are creatures of planetary waves, all of them, including infamous ENSO. While one planetary wave remains relatively stable a cycle is destroyed or born, but waves are a matter of energy transference by its main mechanism, winds. The whole thing is tempered by water vapour, seen at times as clouds, usually found to be around when it is windy. Many meteorologists have called the latest winter cold spell as an “Arctic blast” I tend to disagree, it was more of a continental creation, whereas the coldest air appeared Between 45 to 65 North, over land with more clouds and a low sun, the coolest anomaly for 2099 was in fact between 45-65 N . at +.68 degrees nearly 0.8 degrees cooler than the Arctic. However, the stable influx of cold air in North America has just vanished, in its wake, nothing but a warmer winter, as expected, which will be the norm and not the exception. It is easier to project a warm winter without always saying that it may be colder at times, it is harder to understand weather oscillations which are stable, that is where the cutting edge is.